The Lady MaryPelham was 84ft 2ins long, 24ft broad with two decks and women’s bust figurehead. Captain Jainer Hay received a commission to command this Packet dated 10th February 1816. He subsequently resigned in 1820 when Captain Cary was appointed. The previous Packet of this name was ‘put out of the Service’ in 1817. She was used as a Packet on various routes until1835. 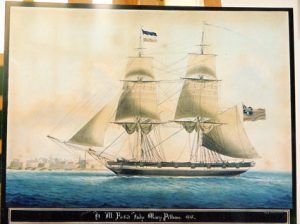 It is known the signal flag flying in the painting was allocated to this vessel until 1835. It had previously identified the Manchester and had been used for the Fox as recently as 1816. It seems likely therefore that the Fox was used as a replacement whilst the new Lady Mary Pelham was being built. As the portrait of the Fox in this collection suggests she was then being used as a temporary Packet whilst the Duke of York was being built during 1819 (see notes for that painting), and as by then the Lady Mary Pelham had been allocated her own flag, it is likely this is an earlier painting than that of the Fox.